Sarah Isgur will just be a political analyst at CNN -- putting the network in the same hole it found itself in before this mess even started. On Friday, Isgur posted a tweet explaining that her role had changed. CNN’s Oliver Darcy quoted a network spokesperson as saying, “We can confirm that when Sarah came to us and proposed her role be adjusted to a political analyst instead, we agreed and we look forward to her starting in that role." It’s been a great vacation but I am back on twitter! And news: I will go to CNN as a Political Analyst instead. Will start next month on air and on line. See y’all soon! Isgur’s hire was controversial for a number of reasons, among them her lack of journalism experience; reports that she pledged loyalty to President Donald Trump; questions about whether she was involved in Fox News’ spread of a conspiracy theory about a murdered Democratic National Committee staffer; and the complete and total lack of transparency surrounding the hiring process. The rollout was an absolute mess, with CNN staffers left in the dark about what her exact responsibilities would be amid conflicting reports. Vox published a statement from CNN that Isgur would not be “leading, overseeing, or running political coverage.” On February 26, The Daily Beast reported that the DNC was told Isgur “will have no editorial decision-making control over the network’s coverage of the 2020 elections.” CNN’s own reporting on the hire was lacking, leaving scoops to other news organizations as the network’s story kept shifting. While the value of adding another pro-Trump voice to CNN's stable of analysts -- especially one who may have signed a nondisparagement agreement -- is debatable, it’s also concerning that CNN doesn’t seem to have learned anything from this debacle. Presumably, if Isgur had not asked for the change in roles, she would have started at CNN as a political editor, something that was never fully explained. Illustrating the utter lack of self-awareness within the network, CNN chief media correspondent Brian Stelter was quoted today saying, “We should, in newsrooms, be as transparent as the people we cover.” When it came to Isgur, CNN failed that simple mission. Cable news leaders — whose decisions help shape the contours of election coverage — are making some of the same sorts of mistakes they made last time. For CNN, though, the appeal [of hiring Isgur] is simple: It “strongly suggests that the network’s big thinkers — including head honcho Jeff Zucker — are aiming for a kind of false fairness: a defensive, both-sides-are-equal kind of political coverage that inevitably fails to serve the voting public,” The Washington Post’s Margaret Sullivan wrote last week. CNN has consistently failed to grapple with its unique vulnerability to this form of false balance. Cable news networks traditionally hire a coterie of partisan contributors and turn them loose to discuss the issues of the day. This leaves viewers confused about where the truth may lie as a representative from one party denounces a person or policy while the other excuses it. The coverage favors stories about optics, scandal and the political horse race over policy. When someone like [President] Trump enters the fray, bringing with him unrestrained mendacity and bigotry, the system breaks down as his adherents defend the indefensible and their segments devolve into shoutfests. CNN’s lack of transparency has been one of the more troubling aspects of this saga. 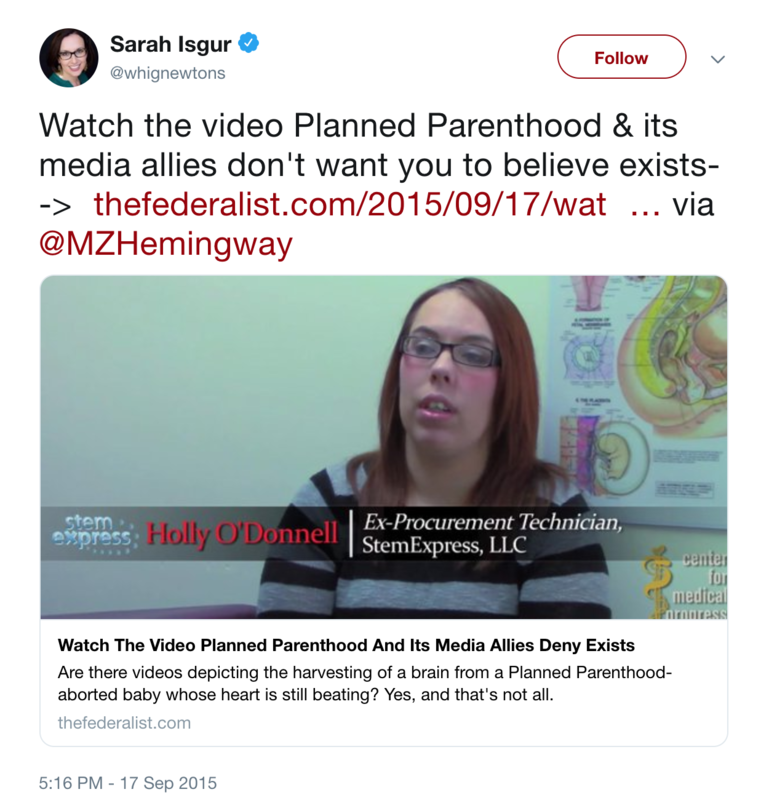 It’s not uncommon for media outlets to hire people with political backgrounds -- a fact Isgur’s supporters have sought to exploit in response to the turmoil her hiring caused. But those hires almost always become contributors, analysts, or reporters -- positions in which their names are publicly affixed to their work in a way that allows the audience to judge the results. But CNN has hired Isgur for a position that will take place at least in part behind the scenes, making it impossible for its viewers to know exactly how she’s influencing the network’s coverage. And rather than publicly addressing the controversy, CNN executives have allowed contradictory details about the contours of her role to drip out over the last week. Meanwhile, other outlets reporting on her job have mostly included descriptions that are sourced to anonymous CNN spokespersons and do not include direct quotes, suggesting the PR representatives had requested to speak on background. While initial reports suggested that Isgur would be playing a senior role in helping to oversee the network’s politics coverage, CNN has subsequently sought to dispute that description. The network’s president reportedly told staffers that she would be “coordinating coverage” rather than “making decisions about” it. The exact distinction between those two descriptions is unclear. It’s also unclear whether CNN’s spokespeople botched their initial explanations of Isgur’s role, whether reporters misunderstood their descriptions, or whether CNN has been scaling back her responsibilities in response to criticism. 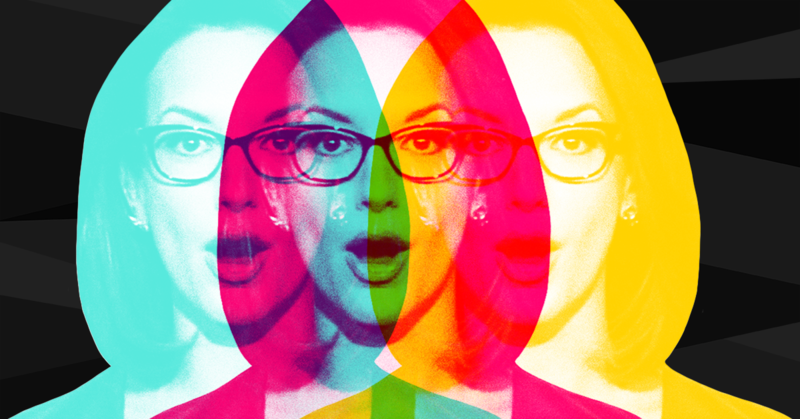 The result has been widespread confusion within and outside the network. Here’s a timeline of how the story of what Isgur will be doing at CNN has developed. CNN media reporter Brian Stelter reported in his nightly newsletter that “CNN PR confirmed that she would report to political director David Chalian but otherwise declined to comment.” He added that his “understanding” is that Isgur “will be joining a group of several political editors who coordinate coverage. This entails managing teams in the field, making decisions about how to frame the day's biggest campaign stories, etcetera.” He also reported on CNN journalists critiquing the hire as well as on CNN executives defending her appointment. “She is helping to coordinate coverage across TV and Digital – she is one of several editors,” the spokesperson added, going on to characterize Isgur’s role as making sure that stories are featured on the right shows and articles get posted online at the right time. Her responsibilities will include making sure stories are showcased on the correct shows and scheduling Ms. Isgur isn’t running CNN’s coverage of the 2020 presidential campaign, according to a company spokeswoman. Her responsibilities will include making sure stories are showcased on the correct shows and scheduling the publication of digital stories. It’s unclear exactly how one could coordinate coverage without making decisions about what is covered, or how CNN can argue that “making sure stories are showcased on the correct shows” doesn’t involve such editorial decision-making. To CNN’s credit, its media criticism show Reliable Sources covered the controversy. To its discredit, no CNN executive appeared to discuss the story. Instead, guest host John Avlon and conservative CNN host S.E. Cupp had to defend the hire (with Avlon citing his own past career as speechwriter for former New York City Mayor and current Trump lawyer Rudy Giuliani), while NPR’s David Folkenflik criticized it. 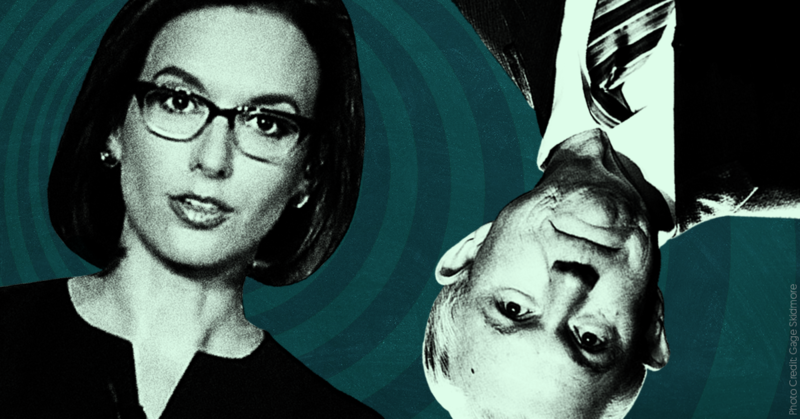 CNN’s decision to hire former Trump official, longtime Republican operative, and journalism neophyte Sarah Isgur as its new political editor is shaping up as quite a public relations disaster for the network. CNN executives are busily trying to explain to their staff why no one should be concerned that Isgur -- who has no journalism experience but reportedly did personally tell the sitting president that “she was on board with his agenda and would be honored to serve him” -- will occupy an editorial post where she will “play a coordinating role in our daily political coverage.” The network is facing internal criticism from staffers, and it had to mollify the Democratic National Committee by promising that Isgur won’t be involved with the 2020 Democratic presidential primary debates that CNN will host. Another problematic aspect of Isgur’s move to CNN is the fact that she was the chief spokesperson for the Department of Justice at a time when her boss, former Attorney General Jeff Sessions, was implementing a harsh crackdown on leakers who fed information to journalists -- a campaign that was launched, at least in part, to shore up Sessions’ standing with President Donald Trump. In her role as a DOJ flack, Isgur defended the seizure of a journalist’s electronic records and cheered the department’s hunt for leakers. This same DOJ flack who cheered on the prosecution of leakers and defended the seizure of a reporter’s communications data will soon be “coordinating” the political coverage of a cable news network. The reporters and journalists who work with Isgur and who have confidential sources within the administration will have to reckon with the fact that their incoming political editor played a key public role in the Trump administration’s war on leakers. CNN has announced it hired former Department of Justice spokesperson Sarah Isgur Flores as a political editor to "coordinate political coverage for the 2020 campaign at the network." This hiring decision is surprising given Isgur’s lack of journalism experience, her conflicts of interest stemming from previous roles in the Trump Justice Department and multiple GOP campaigns, and the fact that she personally pledged loyalty to President Donald Trump. 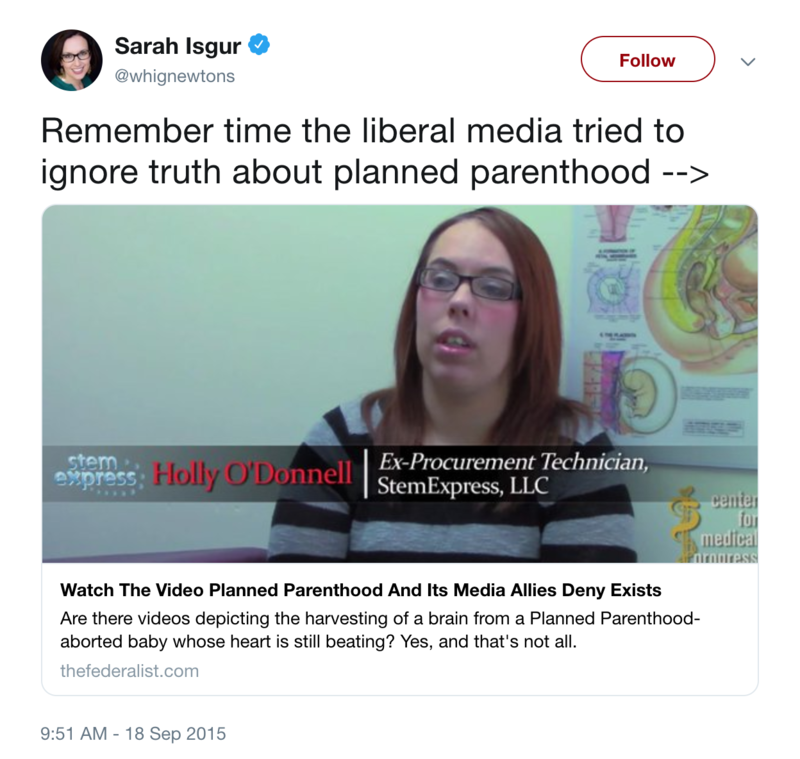 But, additionally, Isgur repeatedly made cable news appearances where she pushed false and highly partisan talking points over the years, raising even more questions about the value of involving her in 2020 campaign coverage. It’s no secret that CNN employs and repeatedly hosts political commentators with ties to President Donald Trump’s administration. 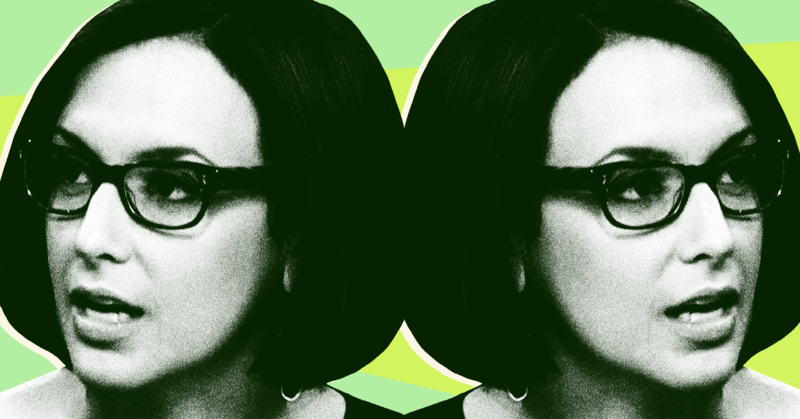 But with the announced hire of Sarah Isgur as a political editor, the network seems set on making its intended “facts first” approach a sisyphean labor -- particularly when it comes to abortion-related coverage. Already, conservative media dominate cable news conversations about abortion with inaccurate information. 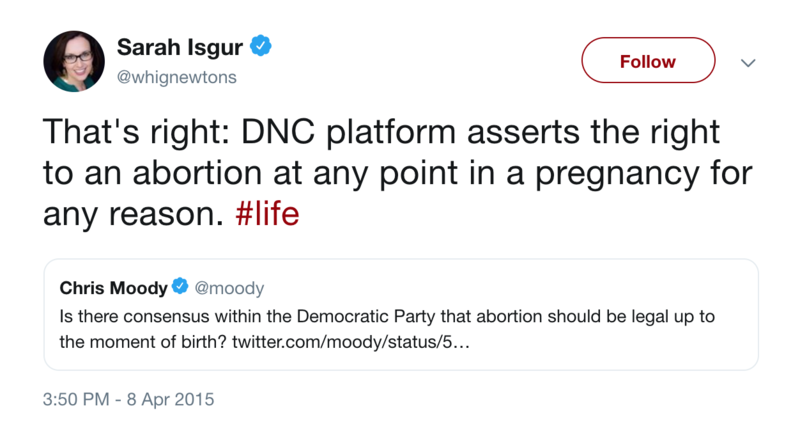 And as a career Republican strategist, Isgur not only lacks formal journalism experience -- a seeming necessity for anyone in an editorial role -- but has also spent years promoting anti-abortion misinformation. Isgur’s installation at CNN comes at a tenuous time for abortion rights. The Supreme Court appears increasingly likely to overturn or weaken Roe v. Wade, and Trump -- after weeks of sensationalized and inaccurate Fox News coverage -- is reportedly committed to spotlighting abortion misinformation in his 2020 campaign. Anti-abortion groups and the Republican Party have similarly seized on allegations of Democratic extremism on abortion rights to rally a perceived base of support ahead of next year’s elections. 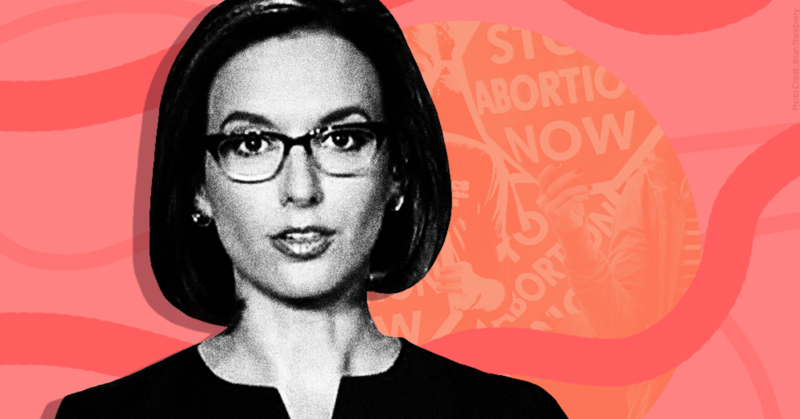 Already in 2019, right-wing media have inundated audiences with a plethora of inaccurate and stigmatizing coverage about abortions and the people who have them. And some outlets outside of this echo chamber have also demonstrated an alarming proclivity for uncritically repeating Trump’s anti-abortion misinformation. 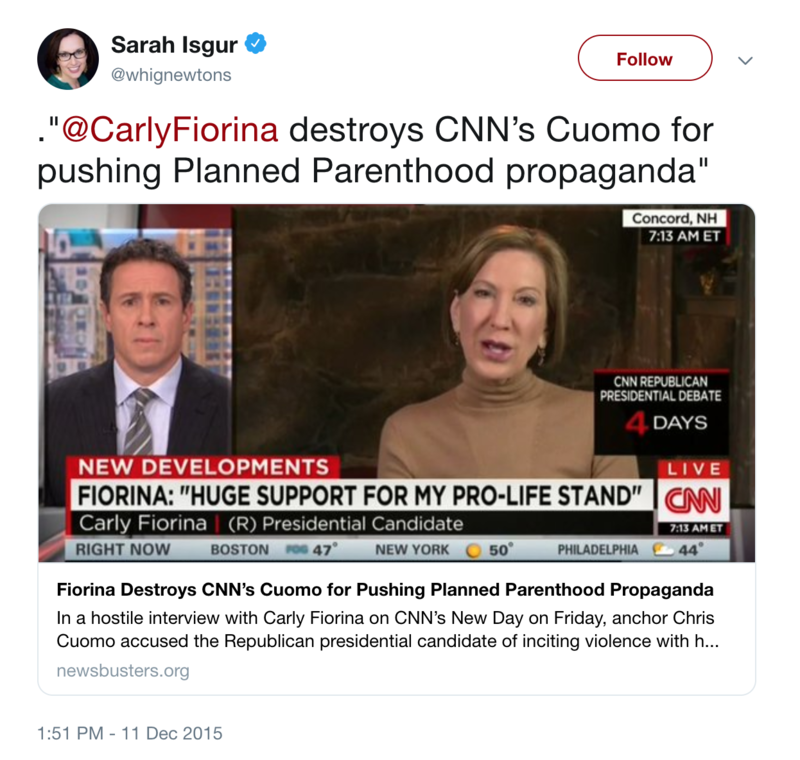 If anything, Isgur’s hiring means that CNN doesn’t need to parrot Trump to spread anti-abortion misinformation anymore -- the lies can come from in-house. 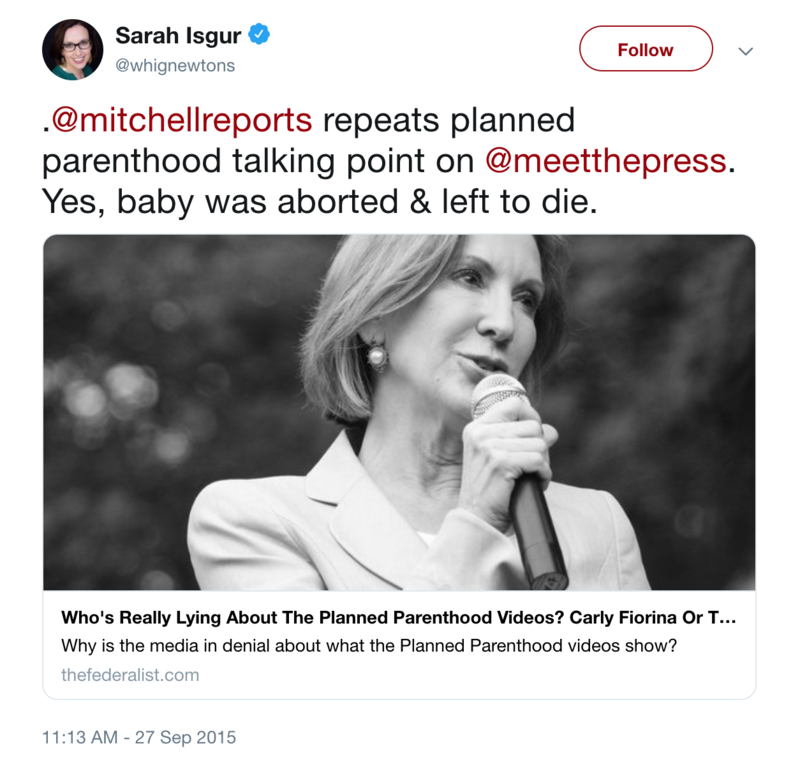 Here’s a sample of the anti-abortion talking points Sarah Isgur has promoted. As it happens, I’m also pro-life. 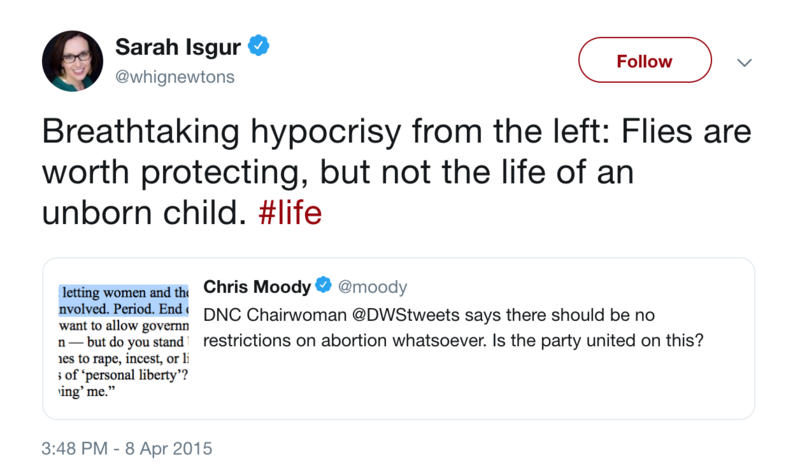 And I’ll admit that I’m simply stunned that people on the Left can argue with a straight face that a mother has a right to kill a baby that can live outside the womb. But, this week in particular, I’m even more stunned at the Left’s hypocrisy on gun control—demonizing conservatives who want to preserve their Second Amendment rights while refusing to even consider restrictions on killing tens of thousands of babies that could live outside the womb. This is why it continues to be hard for conservatives to take liberal’s arguments at face value when it comes to guns. Their ideology trumps logic and facts too often.